I am loving loving loving this new small space dwellers post. 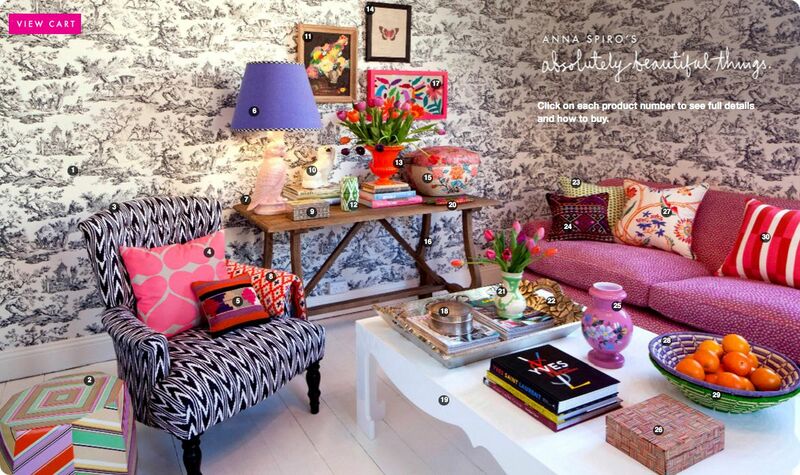 I discovered Anna Spiro's new online shop through one of my fave online mags - Adore Home. Anna's blog :: absolutely beautiful things :: was one of my first bookmarked years ago and I've been enjoying reading her inspirations every since. I just love the concept of her store - shop the seasonal vignette. There are tons of fabulous ideas right inside this room and here are my faves that you can recreate and reinterpret in your own small space. Just because you have walls, it doesn't mean all of your furniture has to be pushed up right against it. I love placing an accent chair or table on an angle, away from the wall, to create a design element and balance in a small space. Use a floor lamp or a side table to anchor the piece. The small space will appear bigger. There's only so much storage space in a small space and often you have to leave your goodies out on display. Forego any idea of a cluttered look by styling your stuff. Anna's coffee table is style for the shoot but you can take a small space tip from this - it looks fantastic and organized. Balance is key here so be considerate of how your room feel in regards to balance and scale. One of my own series on the loving. living. small. blog is all about using your walls and the vertical space available to you. Going up is a great way to move the eyes around the space, allowing it to feel bigger. Check out Anna's small artwork gallery vignette for ideas of your own. Creating a mix of textures and color will definitely make your small space bigger. Of course there should be some design style and balance here - use colors or patterns in a complementing palette. For example consider using all warm tones - reds, oranges, yellows or patterns - stripes, dots, zig zags. You need to add in some neutral balance as well - like Anna's wood console table or the white coffee table. Again, balance in a small space means all the difference in opening up the room. In a small space with tons of visual elements going on, like Anna's room, another big small space tip is to keep the floor completely neutral. The white wood flooring is the perfect foundation to such a visual space. This anchors the room and, yes, provides balance. Keep your floors bare or use a very neutral toned rug to create this look in your own home. Check out more rooms in the small space dwellers series right here. There are over 100 small space tips, tricks and ideas to enjoy. Fun!